Kim and Joel didn’t let rain ruin their big day. The golden sunsets of the wide open land are enough to entice me to fall in love with a country wedding, but when it’s a beautiful modern Australian farm wedding like Kim and Joel’s complete with the memory of a sudden downpour, dancing in the farmhouse garden and dining under sparkling lights – it’s sure to be one best enjoyed over a cup of tea! Emma Nayler was there to capture it all. Congratulations on your marriage Kim and Joel! To read the entire blog and see all the pictures visit Polka Dot Bride’s blog page Thank you for sharing your day with us! Thank you also to Emma Nayler for sharing today’s celebration! It’s a harsh fact, but often what you pay for is what you get. The money you save on cheap wedding suits and dresses will often come back to haunt you. Imagine seeing the blushing bride walking down the isle, love in her eyes as she anticipates standing next to her groom to be at the alter. Then, she notices the man of her dreams tragically draped in a baggy tuxedo, mismatched buttons and poorly hanging lapels. Why is she marrying this fool? Think about this: would you skimp on the repairs to the breaks in your car? Would you skimp on medical care opting to take advice from that creepy guy that hangs around the alley behind the local 7-11? What about skimping on the money you put in the meter to pay for parking? How does that often turn out? See the pattern here? Nothing good comes from the practices of the cheapskate. To put it bluntly, a cheap wedding suit will always be inferior, when compared to a bespoke tailored suit. Cheaper suits will often be fabricated using poor materials. Even if they had fit perfectly upon purchase, they will eventually lose their shape over time; falling to the will of gravity like the skin on your grandpa’s cheeks. Another pitfall of the cheaper suit lies in the effect of ‘Pilling’, which is caused by loose shapeless fabrics rubbing against each other, resulting in the fabrics breaking off and piling up into little balls, making your suit appear to be covered in tiny dull unimaginative Christmas tree decorations. You know the look; the same look as your favourite pair of pyjama pants you wear around the house each and every winter. Let’s face it; you’re no Hugh Heffner. Skimping, here and there, to save a few bucks for your bar tab will only provide you with a disposable one time only suit. You have essentially thrown your hard earned cash into the bin, right where that cheap suit ought to be. Spending a little extra and purchasing a suit made from wool is the safest bet for achieving the best bang for your buck. Wool provides a natural alternative to synthetic materials, which have been known to cause an allergic reaction amongst some of us in the gentleman class. Wool is also more durable and will last a lot longer than that of cheaper fabrics. Another downside to opting for the cheaper suit relates to the quality and care taken during fabrication. The low cost suit, more often that not, is mass-produced by machinery, under little to no supervision, and forget quality control. Spending just that little extra provides piece of mind; knowing that you are paying for the care of quality that only those dedicated to the industry and the craft can provide. Ordering men’s wedding suits from online companies such as Made With Class Suits located on the Gold Coast in Australia, means you are receiving an affordable product form a company with quality and style as their prerogative. Cristiano Del Giacco is a well travelled, health conscious modern man, and a keen observer of life. Some say that first impressions are all that matter. Sadly, once that opportunity to make a first impression is gone, it is gone forever. Appearance is often the key factor in deciding whether your first impression is a successful encounter, or a terrible embarrassment. Your appearance is an illustration of your character, and your attention to detail can be the difference between using a paintbrush and a crayon. The impression you make is not necessarily related to the price tag of your suit, but rather to the care taken in your selection. Purchasing a high priced outfit from the leading brand is not always the best option. Your first priority when selecting a suit should be the fit and the image of class that you gain by wearing it. You shouldn’t sacrifice your potential first impression, and your hard earned money, by opting for brand recognition, and price tag, as the driving factor behind you selection criteria. The suit should enable you to stand out from the crowd, and not as an advertisement for the brand. When buying your suit, remember that the best choice is the one that fits like a second skin. Making keen choices on the suit’s style, based on aesthetics and your preference for comfort, can easily see your affordable suit outshine that of any overpriced name brand. The Slim Fit – This is that second skin we were talking about earlier. This suit shows off the body you have been working hard in the gym for and the ladies will know it. Imagine yourself addressing the room like James Bond, shaken not stirred. Though slim fitting, this style of suit is versatile: suiting various body types and is non restrictive to your movements. The Classic Fit – This style is smooth and comfortable, a style fitting for Hugh Heffner if he ever needed to replace his silk pyjamas. A cut designed to provide room through the shoulders and chest enables the broader gentleman to spread his arms across the back of the chair as he takes a deep puff on his cigar; now that’s a man’s man. The Modern Fit – Sitting on the fence regarding the Slim and Classic Fit? Well, there is a name for men like you, and that’s modern. If you want something with more room that the Slim Fit, while letting everyone know you’re sporting the frame of a Spartan, this style has got you covered. If you’re after a suit for that special occasion, like your wedding day, you may want to choose something that you could wear on future occasions. Ordering a custom tailored suit online from Made With Class Suits on the Gold Coast, means you can be sure that you will find the right balance between quality and cost, while retaining the level of customisation that guarantees satisfaction. Wearing a suit is an expression of class. Your special day should be one to remember. Taking the time, and care to purchase a quality bespoke tailored suit online at Made With Class Suits is evidence to an individual of refinement. Don’t tarnish the memory of your special day by hastily purchasing a suit “Off-the-Rack” falling for the hollow promise of convenience. Selecting a uit that personifies your individual character is a thing of sophistication. Order your tailored suit online with Made With Class Suits and avoid the pitfalls associated within the inaccurate “one size fits all” mantra. Mass produced suits, found in retail stores, are fabricated with one design concept in mind: to provide a product that caters for the common man. But, what constitutes the “common man”, and does he really exist? Most men differ considerably, ranging in variables relating to height, broadness of the shoulders, limb length and thickness. The majority of suits available for purchase at retail outlets worldwide have been fabricated large and baggy in order to cover a larger proportion of the market. A strategy that often results in a situation, where the consumer (that’s you) will require additional tailoring. Control of choice means you are able to govern the cut, style and fit of your suit. Working with your body’s measurements will ensure you receive a sharp looking outfit that accommodates the unique length, circumferences and widths of your frame. Close your eyes and imagine that it is now Oscar night. Imagine movie stars like George Clooney, Brad Pitt, Tom Hardy and Ryan Gosling: Straight-up lady-killers. Think now about a time where each of these men had been dressed in the baggy, loose fitting suits on their march down the red carpet. You can’t can you? I’m not surprised. The difference in image expressed by the tragic teen to that of Ryan Gosling and company comes down to one all important factor: the care and time taken to do things right. The perfect custom suit experience allows the consumer to personalise all facets of the outfit; paying attention to details beginning at fabric selection all the way down to the accompanying buttons, will provide you with a suit that you will want to, and will, wear again and again. The delayed regret experienced as a result from Off-the-Rack purchases is all too real. Far too often will a man’s wardrobes transform into elephant graveyard for these fashion disasters: worn once, then inevitably put down. A suit should not be regarded as a disposable item; the right suit will personify class and class is something you will carry for life. Made With Class Suits consider your requirements as a distinguished individual and are experts in meeting your needs when searching for custom made suits online in Australia. It’s usually all about the dress, but no, not this time! Internationally recognized bridal label Made with Love Bridal’s Carla has partnered up with her husband, Josh, and launched a brother company named Made With Class who specialize in men’s wedding suits. Made with Class bring a unique, trendy yet distinctive men’s line. Just like the duo’s bridal collections, you can expect high quality, timeless garments! Made with Class captures the contours and proper fit of all body types, evoking a real sense of suave style. There’s a fresh, crisp feel to their garments, complimenting both the groom and bride. The rich, deep colour options of the suits reflect the detail of the lace in the gowns. Subtle details like the contrasting threads in the buttons or the stitching on the lapel and cuffs give new life to the idea of groom fashion. Made with Class’ custom designs are making headway, with the focus putting the ‘gent’ back in gentlemen! Made with Class is quickly becoming a must visit showroom for those in the market for men’s wedding suits or men’s business suits. The appointment only showroom is located in Varsity Lakes making it a simple stop for those planning Gold Coast weddings and a quick trip 5 minutes off the highway for those planning Brisbane weddings. Those who’ve entertained the thought of purchasing a tailored suit on the Gold Coast and Brisbane have probably already been slapped in the face with a hefty price tag of upwards of $2000. Made with Class can’t see how competitors can charge so much when they can make suits of equal quality and craftsmanship for a fraction of the price. Made with Class have a business model with limited overheads which enables the buyer to keep more money in their pockets, and more wiggle room in their wedding budgets. Put simply, Made with Class is the complete bespoke suit experience. From the moment a groom makes a booking with Made with Class, they can be guaranteed they’ll be looked after. The customer can select from various styles and choose from over 100 fabrics of different quality to fit in with their wedding budget. There are so many options to view and different style to discuss to completely personalize each suit. And, if someone has already found their dream suit, Made with Class can make it for you simply by bringing it to their appointment or via email. Made with Class take about 15-20 body measurements depending on the style of suit. There are limited options for affordable tailored suits on the Gold Coast which is why Made with Class has become so popular since its establishment for people of all body types and for those who simply can’t find what they’ve been looking for in the shops. Initially Made with Class predominately made men’s wedding suits, however as the business has grown so has the clientele. Made with Class is no stranger to creating men’s business suits for real estate agents, lawyers and bankers. They’re also starting to see return customers who couldn’t resist buying another suit after such good feedback from their colleagues. With Made with Class, a gent can look great every day. At least once a week we get asked the question, “If I could only choose one colour suit, what colour should it be?” This might come across as a relatively simple question to answer for some, however we promise you it’s not. We guarantee that the majority of the public would say that ‘navy’ is the colour to choose, and maybe they’re correct. However, we’re here to argue why you should consider one of the many shades of grey as an alternative option. Don’t get us wrong, we still believe that navy makes for an awesome daytime and business suit. We Just don’t believe that it matches up in versatility against a grey suit. Long gone are the days of the ‘smart relaxed’ look. Douse your collection of chinos with fuel and set a match to them because the time has come to get down and suit up! So we have your attention now, you’re interested in a grey suit. Good, now we’re going to tell you some tips to help you choose which shade, because there is literally 50 of them. To make this blog palatable we’re going to stick to a more definitive question, Light Grey or Dark Grey? Once you decide that then your selection process will be much easier. Traditionally, the darker the grey the more formal the suit is considered. We’re speaking from first hand experience when we say that it’s easier to accessorise with darker suits than it is with the lighter alternative. Weddings – A crisp white shirt with a patterned tie and matching accessories. Funerals – A plain black shirt, high shine black shoes and your choice of black tie. Formal events – French cuffed, cutaway collar with your choice of bow-tie and an understated pocket square. Business Attire – Checked Shirt with a solid tie and tie pin. Light grey is also very versatile and should exist in the wardrobe of any sophisticated suit-wearer. 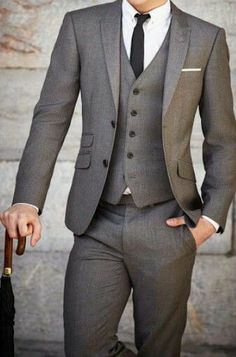 Men who sport suits out of business necessity will naturally want to opt for darker colors and more conservative choices; men who want to look sharp when they go out socially can wear light grey with confidence. The color will stand out as a consciously-thought choice rather than a default style. Wearing a light grey suit is is a great way to feel like you’re dapperly dressed without feeling like you’re in a business meeting. Men who reside or work in hot, humid climates will also want to think about investing in a light grey suit, especially one that is lined with 100% natural fibers like ours at Made with Class Suits. It’s no surprise that dress codes tend to relax as the thermometer climbs, meaning that a light grey suit might be a more useful piece of business wear for those working in a tropical climate. At the end of the day, light grey isn’t a suit that every man needs – but it’s a colour that nearly any man can look good in if he wants to. Many of our customers are using their light grey blazers in combinations of blue or black trousers, getting the maximum mileage out of their garment. This looks fantastic. Adding a light gray suit to the closet gives you a powerful tool for social occasions and a unique chance to stand out in a crowd. Here’s an example of some light grey options. If you’re interested in purchasing a suit through us please contact us here. WHAT TO DO WITH YOUR MEN WEDDING SUIT POST WEDDING? More often than not you’ll spend more time choosing your suit’s features and fabrics than the actual amount of time you’ll spend wearing it. Don’t put your wedding suit in the garment bag and shove it in the back corner of your closet! It’s time to get creative and maximise the mileage on your garment! Here is some nice little tips to ensure that you get the most out of your wedding suit once your actual wedding day is done and dusted. If you wore a three piece suit for your wedding day, don’t be scared to leave the waistcoat in the cupboard. We recommend leaving the waistcoat for special occasions! Don’t be that guy who wears a three piece everywhere he goes. Unless your name is Connor McGregor it’s probably not a good idea. Bring the waistcoat out of retirement when you head to the races. Let your suit jacket fly solo. Take the jacket and use it as a blazer! This is a common practice for many stylish gents. Your tailored jacket should be so well fit that it will be able to survive on its own without the support of matching trousers. Blazers look great with a nice cut of blue jeans and t-shirt and patent leather lace-ups. You can do the same with your trousers. Using your tailored trousers with your favourite button down is a great way to pull off semi-casual. Stretch your investment entirely and wear your pants with a crisp, polo and some cool fresh kicks. 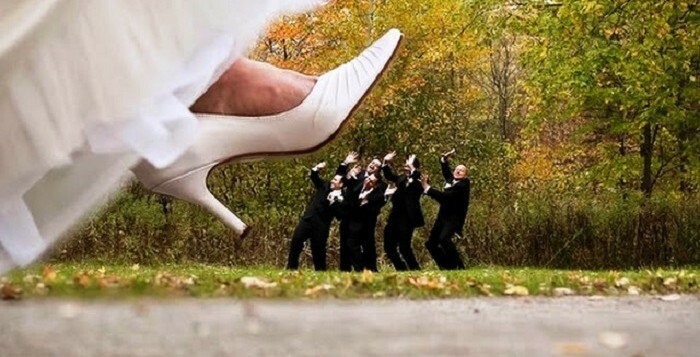 Gentlemen, it’s time to face the facts: When it comes to weddings, it’s all about the bride. This shouldn’t be alarming news for you. From the instant you propose right through to the reception you will be on the outskirts of the spotlight. And then of course, there’s the wedding dress. Good food and tear jerking speeches will generate some buzz, but one thing’s for certain, at the end of the day everyone will look back and think about THAT DRESS. As gentlemen we wouldn’t want it any other way, but surely theirs something in it for us? Lucky for you, we have some tips. Invest in a quality suit. Avoid renting. suit or tuxedo for the big day. If this is you, we don’t totally blame you for it either. After all you’re only going to be wearing the suit for a few hours. However, we’re gentlemen now, this isn’t your high school formal. Seldom does a rented suit fit perfectly, nor is it exactly the type of suit you imagined. Not to mention, if you rent you’ll be wearing the exact suit as someone else wore on their special day. Leave the corporate suits for work. So often we have customers who will design their suit to be one that they can wear after their wedding day. Deep down we can see some who want to be outlandish and different but fear what others may think. Take a risk because you want to look like you’re getting married, not doing a PowerPoint presentation? Suiting up is one of man’s finest luxuries. Why should you have to settle for your business suit or off the shelf rental? Be bold, mix things up and jump into something that you’re not normally used to. Throw in waistcoat or a different colour lining! Give your suit some personality and character, we guarantee it’ll pay off! Let the suit do the talking. Look at your budget and see where your money is going. This is your big day and it only comes around once (unless you’re Kim Kardashian). You’ve worked hard leading up to this momentous occasion and deserve to feel amazing whilst wearing your suit. We can tailor a bespoke suit to your measurements for a fraction of the big name brands. An affordable but perfectly cut suit will look like a million bucks. Unfortunately the same can’t be said about an expensive ill-fitted one. Not long ago we walked into a reputable store the other day who were advertising a discount sale on their suits. After factoring in the discount the suit was still going to cost us more than $1000. This suit did not fit well at all. I felt like a complete clown. We asked the shop assistant if they had an alterations team who could take in the jacket and raise the sleeves but we were told that alterations would need to be arranged by us at our own expense. We walked away from the store feeling unsatisfied with the customer service, thank goodness we only wasted our time and not our money. Don’t cut cost with fabric. A tailor’s magic can only do so much. Even the best tailors need quality fabric to construct a spectacular wedding suit. A baggy, shapeless composition will leave you looking like a prepubescent teen trying on his big brothers clothes. A quality cloth, on the other hand, will do just the opposite. Consider upgrading your suit to be canvased instead of fused, improving the longevity and shape of your jacket. Cutting cost now will cost you time and money in the future! In conclusion all the wedding guests will be staring at your beautiful fiancé/wife. However there will be a time throughout the ceremony where you’ll steal a few glances from your family and friends and you are going to make it count! Good luck gentlemen, have fun in the back seat but don’t let her walk completely over you haha. Most men we’ve had the pleasure of meeting have said that owning a tailored made suit always seemed out of their reach. They thought that bespoke suits would be out of their budget and simply a fantasy for those who could afford it. Well that may be true, depending on where you’re looking. However there are a lot of myths out there when it comes to tailored suits, and there are plenty of good practical reasons why you should consider making your next suit purchase a custom one. Myth: Getting tailored is time consuming. Some people think that finding a tailor is costly and inconvenient, however Made With Class we is anything but. Our price range is affordable and our process is easy. We meet with people on a daily basis who’ve searched through countless stores hoping to find their dream suit that they’ve long envisioned only to settle for something different because they were running out of time and/or money. At Made With Class Suits we make your suit exactly how you want it. We’re able to take your body measurements and alter them depending on what style and cut of suit you want. Due to the fact that we make your suits from scratch, we can ask you all the right questions to ensure your suit will be one of preference. • Do you want your suit to be classic, slim or super slim fit? • Do you want your trousers to be cuffed, un-cuffed and have a tapered finish? • How many buttons on your cuffs, and what colour do you want them to be? • What type of lapel do you want and would you prefer it to be thick or thin? There are so many options, and we can go through them all during our appointment. Our point is, why look around through a bazillion stores for something that you may not find when you can do it all at once for a fraction of the time and effort. Myth: Off the rack suits are the same quality as a bespoke suit. This is a common misconception. We’re not saying that all ‘off the rack’ suits are bad quality, but there is definitely a difference in the level of class between the two. Off the rack suits are made according to generic sizes and processed quickly through machines on an assembly line. Even the expensive suits that you find from reputable stores were spat out by machine to fit the ‘average body type’. If you purchase a suit through Made With Class, you’re guaranteed that your garment will be overseen by a real person from our Made With Class team. We’re accountable for every feature of your suit because every detail has been specifically chosen by the customer, therefore the attention-to-detail and quality simply cannot be compared to off the rack garments. In addition, don’t forget that when you get a suit tailored through us you have the option of things like canvas. What’s canvas? Typically it’s a separate layer of cotton and horsehair that runs throughout the important structural areas of our suit. In essence, the canvas acts as the “bones” of your garment and will increase the longevity of your suit, especially if you’re one who will take it to the dry cleaners on a regular basis. Having your suit semi or fully canvased will improve both shape and strength, as well as mold the suit to your body. Some people will opt to have their suits fused because they’re the more affordable alternative, however isn’t it nice to have the option? Myth: Tailor-made suits are too expensive. every suit can’t be expected to compete against those prices. However keep in mind, bespoke suits become quite affordable when you start to look at the big picture.First off, as mentioned earlier your time is valuable. If you buy through us the chances are good that you’ll save a lot of time over trying to find an off-the-rack suit that works. Secondly, a tailored suit will last longer and is the best option for those who plan on wearing their suits on a regular basis. This will mean that you will replace them less. Many of our customers contact us hoping that we can replicate the look and style of the more popular and expensive brands. This is something that we can do with relative ease, and we do it for a fraction of the price.